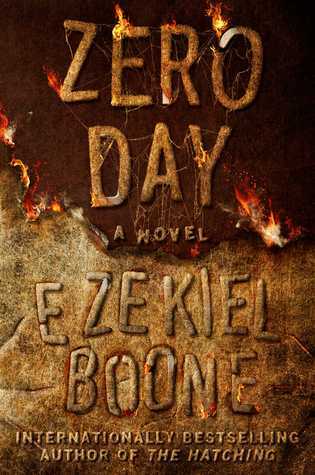 The finale to Ezekiel Boone's near-apocalyptic monster-horror series. After a long-dormant species of carnivorous spiders hatches and overruns the globe, tens of millions of people have been killed and eaten, or worse...and US president Stephanie Pilgrim has had to order nuclear strikes on major American cities, roads and infrastructure to try to give the survivors a fighting chance. She and her close advisers, along with spider expert Melanie Guyer and her team of scientists, have retreated to a US Navy aircraft carrier off the East Coast to plot their next move when a mutiny breaks out that pits military men looking for a final solution against the president and her allies, who don't think that blowing everything up is the right way to go. Pilgrim and her people escape to the one spider-free zone they're certain of, setting up a White House in Manhattan. But how can they survive with the odds so stacked against them? Still, they have no choice but to try... rallying the unlikeliest set of spider fighters on whom the fate of humanity rests. This was a satisfying conclusion to The Hatching series! First, came The Hatching. Next, was Skitter. 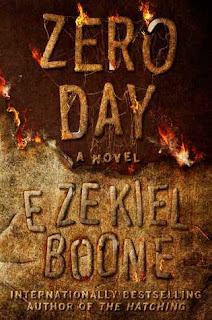 I wasn't sure what to expect with Zero Day, but I really like where Boone took us. A couple of my favourite characters in this trilogy were the Preppers, Shotgun and Gordo. I found it amusing that they had this fabulous underground bunker all set up for the apocalypse where they could just hunker down and wait out whatever happens. Did they stay underground? No! They are front and centre in Zero Day with their invention and weapon of destruction against the spider apocalypse. Actually, it isn't exactly a weapon but more like a tracker which zeros in on the queens. Dr. Guyer's theory that the queens control the other spiders is right, but the military doesn't want to wait for her to figure out a plan of action. They just want to annihilate and obliterate everything! They try to overthrow the President, and Melanie with Shotgun and Gordo are running out of time. The story was fast-paced and totally gave me the heebie-jeebies. I hate spiders! Boone created a great cast of characters, and I really enjoyed this series. I can't wait for Boone's next release, The Mansion, which is expected to be published in December. 4 stars!! It was really good, and you should put it on your TBR if you enjoy horror or apocalyptic sci-fi!